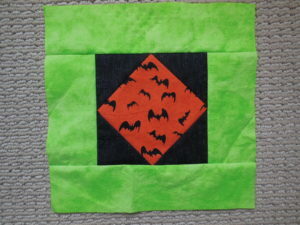 I’ve never made a Halloween quilt, so this single piece of Halloween fabric must have been a gift. It’s the only block I’ll be making this month since I limit myself to using my stash for block lotto blocks. I hope more of you get into the Halloween spirit and have appropriate fabric for this fun theme. It only takes ONE chance to win. Good luck!